Our paper on deformable models for the reconstruction of the neonatal cortex from structural T2-weighted brain MR images was accepted for presentation at the 2017 IEEE 14th International Symposium on Biomedical Imaging (ISBI) which takes place this year April 18-21 in Melbourne, Australia. 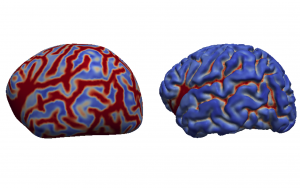 Two stages of deformable mesh reconstruction of one hemisphere of a white matter surface. Colour depicts residual distance. We present a method based on deformable meshes for the reconstruction of the cortical surfaces of the developing human brain at the neonatal period. It employs a brain segmentation for the reconstruction of an initial inner cortical surface mesh. Errors in the segmentation resulting from poor tissue contrast in neonatal MRI and partial volume effects are subsequently accounted for by a local edge-based refinement. We show that the obtained surface models define the cortical boundaries more accurately than the segmentation. The surface meshes are further guaranteed to not intersect and subdivide the brain volume into disjoint regions. The proposed method generates topologically correct surfaces which facilitate both a flattening and spherical mapping of the cortex.